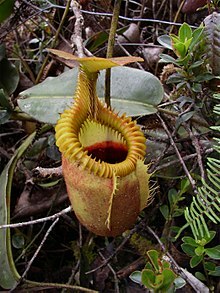 Dit is een lijst van Nepenthes-soorten, gesorteerd naar hun verspreidingsgebied. De lijst is gebaseerd op Stewart McPhersons Pitcher Plants of the Old World uit 2009. Aangevulde informatie is voorzien van een referentie. Soorten die niet endemisch zijn in hun regio zijn voorzien van een asterisk (*), deze taxa worden meerdere keren genoemd. ↑ a b (en) Clarke, C., C.C. Lee & V. Enar 2014. Observations of the natural history and ecology of Nepenthes campanulata. Carnivorous Plant Newsletter 43(1): 7–13. ↑ a b (en) McPherson, S.R. & V.B. Amoroso 2011. Field Guide to the Pitcher Plants of the Philippines. Redfern Natural History Productions, Poole. ↑ (en) McPherson, S., J. Cervancia, C. Lee, M. Jaunzems, A. Fleischmann, F. Mey, E. Gironella & A. Robinson 2010. Nepenthes gantungensis (Nepenthaceae), a new pitcher plant species from Mount Gantung, Palawan, Philippines. In: S.R. McPherson Carnivorous Plants and their Habitats. Volume 2. Redfern Natural History Productions, Poole. pp. 1286–1295. ↑ (en) Gronemeyer, T., A. Wistuba, V. Heinrich, S. McPherson, F. Mey & A. Amoroso 2010. Nepenthes hamiguitanensis (Nepenthaceae), a new pitcher plant species from Mindanao Island, Philippines. In: S.R. McPherson Carnivorous Plants and their Habitats. Volume 2. Redfern Natural History Productions, Poole. pp. 1296–1305. ↑ (en) McPherson, S., G. Bourke, J. Cervancia, M. Jaunzems, E. Gironella, A. Robinson & A. Fleischmann 2011. Nepenthes leonardoi (Nepenthaceae), a new pitcher plant species from Palawan, Philippines. Carniflora Australis 8(1): 4–19. ↑ (en) Mansell, G. & W. Suarez (2016). Nepenthes nebularum, a new species from Mindanao, Philippines. Carnivorous Plant Newsletter 45(4): 132–139. ↑ (en) McPherson, S., J. Cervancia, C. Lee, M. Jaunzems, A. Fleischmann, F. Mey, E. Gironella & A. Robinson 2010. Nepenthes palawanensis (Nepenthaceae), a new pitcher plant species from Sultan Peak, Palawan Island, Philippines. In: S.R. McPherson Carnivorous Plants and their Habitats. Volume 2. Redfern Natural History Productions, Poole. pp. 1332–1339. ↑ (en) Cheek, M. 2014. Nomen novum Nepenthes. Planta Carnivora 36(2): 44–45. ↑ (de) Micheler, M., T. Gronemeyer, A. Wistuba, D. Marwinski, W. Suarez & V. Amoroso 2013. Nepenthes viridis, eine neue Nepenthes-Art von der Insel Dinagat, Philippinen. Das Taublatt 76: 4–21. ↑ (en) McPherson, S.R. 2011. The discovery of Nepenthes sp. 'Anipahan'. In: New Nepenthes: Volume One. Redfern Natural History Productions, Poole. pp. 330–345. ↑ (en) Lee, C.C., G. Bourke, W. Taylor, S.T. Yeo & K. Rembold 2011. Nepenthes appendiculata, a new pitcher plant from Sarawak. In: McPherson, S.R. New Nepenthes: Volume One. Redfern Natural History Productions, Poole. pp. 24–35. ↑ (en) Robinson, A.S., J. Nerz & A. Wistuba 2011. Nepenthes epiphytica, a new pitcher plant from East Kalimantan. In: McPherson, S.R. New Nepenthes: Volume One. Redfern Natural History Productions, Poole. pp. 36–51. ↑ (en) Nerz, J., A. Wistuba, C.C. Lee, G. Bourke, U. Zimmermann & S. McPherson 2011. Nepenthes nigra, a new pitcher plant from Central Sulawesi. In: McPherson, S.R. New Nepenthes: Volume One. Redfern Natural History Productions, Poole. pp. 468–491. ↑ (en) Lee, C.C., A. Wistuba, J. Nerz, U. Zimmermann, A.P. Paserang & R. Pitopang 2011. Nepenthes undulatifolia, a new pitcher plant from South East Sulawesi. In: McPherson, S.R. New Nepenthes: Volume One. Redfern Natural History Productions, Poole. pp. 492–505. ↑ (en) Catalano, M. 2010. Nepenthes andamana M. Catal. sp. nov. In: Nepenthes della Thailandia: Diario di viaggio. Praag. p. 34. ↑ (en) Catalano, M. 2010. Nepenthes chang M. Catal. sp. nov. In: Nepenthes della Thailandia: Diario di viaggio. Praag. p. 38. ↑ (en) Catalano, M. 2010. Nepenthes kerrii M. Catal. et T. Kruetr. sp. nov. In: Nepenthes della Thailandia: Diario di viaggio. Praag. p. 32. ↑ (en) Catalano, M. 2010. Nepenthes suratensis M. Catal. sp. nov. In: Nepenthes della Thailandia: Diario di viaggio. Praag. p. 36. ↑ (en) Mey, F.S. 2016. The beautiful Nepenthes kampotiana x bokorensis. Strange Fruits: A Garden's Chronicle, 5 October 2016. ↑ (en) Mey, F.S., M. Catalano, C. Clarke, A. Robinson, A. Fleischmann & S. McPherson 2010. Nepenthes holdenii (Nepenthaceae), a new species of pyrophytic pitcher plant from the Cardamom Mountains of Cambodia. In: S.R. McPherson Carnivorous Plants and their Habitats. Volume 2. Redfern Natural History Productions, Poole. pp. 1306–1331. ↑ (en) Mey, F.S. 2010. Introduction to the pitcher plants (Nepenthes) of Cambodia. Cambodian Journal of Natural History 2010(2): 106–117. ↑ (en) Nunn, R. & C.N.A. Vu 2016. An account of the Nepenthes species of Vietnam. Carnivorous Plant Newsletter 45(3): 93–101. ↑ (it) Catalano, M. 2010. Nepenthes della Thailandia: Diario di viaggio. Praag. ↑ (en) Robinson, A., J. Nerz, A. Wistuba, M. Mansur & S. McPherson 2011. Nepenthes lamii Jebb & Cheek, an emended description resulting from the separation of a two-species complex, and the introduction of Nepenthes monticola, a new species of highland pitcher plant from New Guinea. In: McPherson, S.R. New Nepenthes: Volume One. Redfern Natural History Productions, Poole. pp. 522–555. Zie de categorie Nepenthes van Wikimedia Commons voor mediabestanden over dit onderwerp. Deze pagina is voor het laatst bewerkt op 20 mrt 2019 om 13:06.